Do Grain-Free Diets Lead to Heart Disease? There was an article published recently that seems to have incited quite a bit of confusion in the animal nutrition world. The report claims that grain-free diets may be the cause of increased heart disease in dogs. More specifically, a condition known as dilated cardiomyopathy. The article, unfortunately, is very misleading. This blog will discuss what the paper says, what is misleading, and where there may be some actual truth. First of all, if you read the article carefully – the article never claims that the sole culprit is grain-free diets. 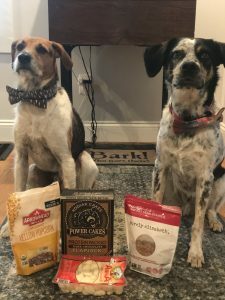 Rather, the authors cite that the diets of affected animals feature “boutique, grain-free, or exotic ingredients.” They are actually lumping together numerous different diets into a group rather than focusing on one specifically. Also, they never cite exactly what a grain-free diet is. For example, if I were to feed my dog nothing but spinach it would be a grain-free diet – but that probably isn’t very healthy for my dog. However, what if my pet’s grain free diet features meat and other nutrients to complete a well-rounded meal? Both diets don’t include grain, but one is clearly better for my pet than the other. Wouldn’t you agree? I believe part of the confusion stems from the fact that grain-free can mean many different things. Taurine deficiency and heart disease? Next, the article implies that the heart disease associated with grain-free diets is probably related to taurine deficiency. Taurine is an amino acid that has been implicated in heart disease for cats and dogs. However, linking grain-free diets and taurine deficiency is nonsensical seeing as animals don’t derive taurine from grain. Rather, the majority of taurine is found in muscle meat, and is completely absent in cereal grains. Therefore, a diet absent of grains shouldn’t lead to taurine deficiency. Logic would lead you to conclude the absence of meat would lead to taurine deficiency. This is why your pet’s nutrition should feature real meat and not byproducts such as meat meals. Byproducts and meat meals are highly processed, which can destroy the nutrient content of the meat – if there’s any real meat left anyways. In my opinion, it is more critical to feed a high quality diet featuring real meat if you want to avoid the specific heart condition the authors are concerned about. What about the other diets the authors list? The authors never cite grain-free diets as the specific issue, rather they lump it together with other diets by phrasing it as “boutique or grain-free diets” – and I believe intentionally. This article seems like it was meant to make pet owners question well rounded grain-free diets by grouping it with very generalized diets. When you do this, you can make pretty large assumptions that relate to one group, but not the other. For example, the author can claim anything as being boutique since they don’t define what they consider to be a standard diet and then attack a boutique diet. With that being said, they do mention exotic meats as being troublesome throughout the article – and this may be well warranted. Poultry, a pretty common protein source for our dogs, is very high in taurine. However, certain foods such as lamb, venison, and rabbit contain much less of the important amino acid. It is possible that feeding diets that feature only these proteins could contribute to heart disease. Therefore, it may be worth rotating proteins that have higher taurine content into your pet’s diet. Here is a list of some meats high in taurine content! In the end, I believe the article is very misleading. For one, it lumps together many diet types with grain-free diets so that the authors can make more generalized statements. Additionally, grain-free can literally mean anything. Feeding your dog rocks is grain-free, but guess what? It’s not healthy for them. Do I think a little bit of grain in a dog’s diet is problematic? No, I do not. However, feeding a diet that is predominantly grain probably sets your pet up for other chronic conditions such as diabetes. Concerned about your pet developing dilated cardiomyopathy? Focus more on high quality meat and less about grain. http://advancedanimalchiropractic.com/wp-content/uploads/2018/07/grain-e1532991451939.jpg 4032 3024 Dr. Christina Cole http://advancedanimalchiropractic.com/wp-content/uploads/2019/02/logo-l2.png Dr. Christina Cole2018-07-30 23:02:302018-07-30 23:02:30Do Grain-Free Diets Lead to Heart Disease?